According to the U.S. Endangered Species Act, all federal agencies must ensure that their actions do not harm the existence of endangered or threatened species. Endangered species are at the brink of extinction, while threatened species are likely to be at the brink of extinction in the near future. Together, these species are called listed species. As the Environmental Protection Agency (EPA) is responsible for registering insecticides, it must therefore examine the potential effects of insecticides on listed species and/or their critical habitat (see Figure 1). Insecticides are a class of pesticides that are designed to kill insects; however some insecticides can also harm other living organisms. Last year, the EPA looked at three insecticides; Chlorpyrifos, Malathion, and Diazinon. These insecticides cause harmful effects to many different organisms by interfering with brain cell communication. Together, they are found in over 250 insecticide products available for sale. They can be applied on crops, in orchards, greenhouses and nurseries, and in public areas for controlling mosquitoes. The EPA gauged if the listed species would be harmed by the use of the three insecticides by finding the amounts of insecticide that the listed species are getting exposed to and comparing it with the amounts of insecticide that causes any toxic effect on the listed species. Listed species’ exposure to insecticides can occur whenever there is an overlap between the habitat range of the listed species and the insecticide application area. The insecticides are mostly applied by spraying a ‘target’ area (example: a crop field infested with insect pests). However, due to wind (if the insecticide is in the air) and water movement (if the insecticide has settled on soil), the insecticide can move away from the ‘target’ site and affect listed species in other areas. This was also considered by the EPA. The EPA estimated the amounts of insecticides that the listed species would get exposed to by using computer models. The models predicted how the insecticides would move in the environment and how much of the insecticides would be found at different locations in the country. The EPA had to rely on data that were gathered for other species to estimate the toxicity of the insecticides on listed species. This is because there were very few toxicity studies carried out on the listed species. When accounting for all species, there were over 1400 studies available for Chlorpyrifos, over 900 for Malathion and over 500 for Diazinon. These studies looked at effects like death, reduced growth and reproductive failures. The results from these studies were extrapolated to listed species through a model. The model employed contains insecticide toxicity values for multiple species, and the more sensitive species (i.e., species that were harmed by lower amounts of the insecticides) were used as surrogates for listed species. Figure 1. 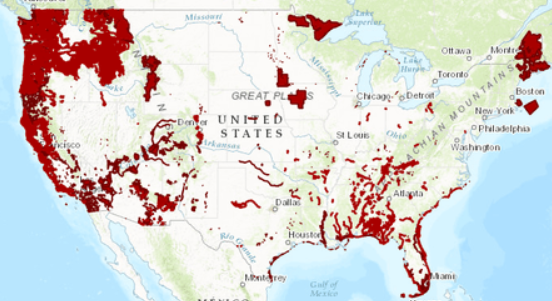 The location of critical habitats (areas essential for conservation of threatened and endangered species) in mainland United States. Photo Source: U.S. Fish and Wildlife Services. The EPA assessed the impact of the three insecticides on 1835 listed species, like amphibians, birds, fish, mammals, plants, reptiles and water and land invertebrates (see Table 1), and on 794 critical habitats (see Table 2). EPA’s risk assessment was conservative, meaning that exposure and toxicity were likely over-estimated. This is done to weed out species that will definitely be safe from insecticide exposure. Further analyses will be carried out for species that are likely be harmed. This will be done using more realistic exposure and toxicity values. No effect = Insecticide will not cause a harmful effect to listed species. No further analyses are required. Not likely to adversely affect = Insecticide will not likely cause a harmful effect to listed species. The EPA must consult with the U.S. Fish and Wildlife Services to see whether further analyses are required. Likely to adversely affect = Insecticide will likely cause a harmful effect to listed species. EPA must carry out further analyses. Chlorpyrifos and Malathion are likely to harm a greater number of listed species as compared to Diazinon (97% vs 78%) because they are registered for controlling mosquitoes, among other things. Mosquito control insecticides are applied over a wider geographic area and hence, more listed species are likely to be exposed to them. Regardless, for the majority of listed species and their critical habitats, all three insecticides are likely to cause a harmful effect (i.e., either death, reduced growth or reproductive failure) under this conservative risk assessment. Hence, to more accurately understand the effects of these insecticides on listed species, EPA will have to carry out further analyses that are more realistic.